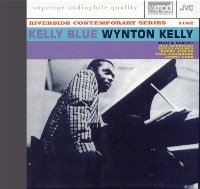 Kelly Blue is one of the best leader albums by Wynton Kelly, who was famous for his blues feeling, crisp touch and flowing single note runs. This special SHM-SACD reissue includs two bonus tracks, including five tracks by the great trio (with Paul Chambers and Jimmy Cobb) and three by the sextet (including Bobby Jasper, Benny Golson and Nat Adderley on horns). Swingy and lyrical hard bop at its best! Recorded in 1959. This XRCD reissue produced by Akira Taguchi and mastered by Alan Yoshida at A&M Mastering Studios, Hollywood, CA. Includes two bonus tracks not on the original LP. XRCD from JVC brings the listener higher fidelity and improved audio quality by enhancing the process of mastering and manufacturing compact discs. The XRCD is compatible with all CD players.